Be the first to share your favorite memory, photo or story of Shawn . This memorial page is dedicated for family, friends and future generations to celebrate the life of their loved one. Saint Albans – Shawn M. Montcalm passed away Saturday, March 16, 2019, at his home, following a brief battle with cancer. His mother, Marie, was at his side. Born in Burlington, VT on August 30, 1967, son of Marie Montcalm. Shawn was 51 years old. 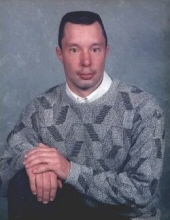 Shawn also had a love for snowmobiling, specifically his love of Artic Cats. He loved the freedom of making loops around the yard and in the fields on Upper Welden Street. He meticulously cared for his machine and all engines. He was a communicant of Holy Angels Parish. Shawn attended St. Albans Elementary and Bellows Free Academy special education graduating in 1986. He was a member of Vermont Catholic Cursillo and a proud member of the Knights of Columbus 3rd and 4th degrees. Shawn was pre-deceased by his grandparents, Hosanna and Vivian Montcalm and Arnold “Bud” and Eva Bessette; his aunt and uncles, Jeanne (Montcalm) Poirier, Paul Bouchard, Rene Montcalm, Charles Thweatt and Jerry Montcalm, as well as his cousins, Jacqueline, Leetha, Loren, Eben and Joseph. A special thank you to the ER staff at NMC, Amcare Ambulance and the University of VT Medical Center Oncology, Radiation Oncology and Pulmonary Surgery Departments. A Mass of Christian Burial will be celebrated on Thursday, March 21, 2019, at 11:00 AM at Holy Angels Catholic Church, 245 Lake St, St. Albans. The Reverend Maurice J. Roy will be the celebrant. Interment will be at a later date in Mount Calvary Cemetery. Those planning an expression of sympathy are asked to consider the Vermont Right to Life Committee, P.O. Box 1079, Montpelier, Vermont 05601 or Silver Towers Endowment Trust Fund, c/o Joseph Montcalm, PO. Box 416, St. Albans Bay, Vermont 05481. To plant a tree in memory of Shawn M. Montcalm, please visit our Tribute Store. "Email Address" would like to share the life celebration of Shawn M. Montcalm. Click on the "link" to go to share a favorite memory or leave a condolence message for the family.